Controversial conservative speaker Milo Yiannopoulos’ campus appearance was canceled Wednesday evening after a group of about 150 violent agitators interrupted an otherwise peaceful protest of more than 1,500 people, resulting in large fires and several broken windows in the Martin Luther King Jr. Student Union building. 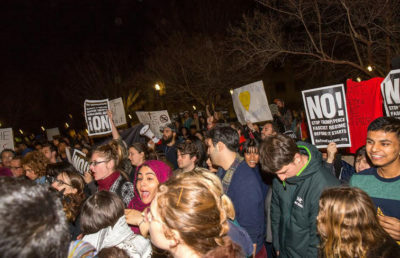 By 5:30 p.m., protesters had amassed on Sproul Plaza and were chanting, “No Milo, no Trump, no fascist U.S.A.” The protests later escalated, and some outside the building set off fireworks, threw rocks and bricks and hammered windows. UCPD determined that it was necessary to evacuate Yiannopoulos from the premises to ensure his safety about 6:00 p.m., but protests continued. 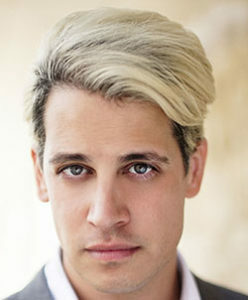 Yiannopoulos, an editor for the conservative news site Breitbart, was invited to speak by campus political group Berkeley College Republicans, or BCR. 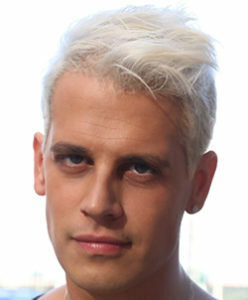 After Yiannopoulos evacuated the campus, he said on Facebook that he and his team were safe. About five people were injured during the course of the event with varying degrees of severity, according to BPD spokesperson Officer Byron White. Both BPD and UCPD did not make any arrests. Eddy Brock, a campus alumnus who planned to attend the Yiannopoulos event, said the group of radical protesters allegedly punched him in the face and attacked him with rocks, leaving him with lacerations. Uber driver Casey Benson, who was working near Bancroft Way, said he saw people wearing all black and masks about 6 p.m. The masked individuals blocked the road with barricades from a construction site and then set it on fire while chanting, according to Benson. Campus junior Kenny Lu also saw masked individuals start the fire before fleeing the scene. About 6:20 p.m., UCPD began deploying rubber bullets. UCPD also announced that all campus buildings were on lockdown and advised students to shelter in place. Some members of the crowd knocked over a flood light and set it on fire. The flood light exploded shortly thereafter and became a “whirlpool fire,” said BCR treasurer David Craig. By 6:30 p.m., UCPD declared the meeting an unlawful assembly and gave the crowd 10 minutes to disperse. About 6:40 p.m., UCPD issued a stay-away order in the area where Bancroft Way and Telegraph Avenue intersect. Craig, however, said he was disappointed that the event was canceled and was disturbed by how violent the protests became. BPD announced about 6:53 p.m. that crowd members along the Telegraph Avenue corridor were engaging in physical fights with one another. According to campus senior Alex Crawford, some people in the crowd grabbed and threw a man who was wearing a “Make America Great Again” hat. About 8:15 p.m., BPD announced that hundreds of people were walking southbound on Telegraph Avenue, approaching Channing Way. Many of the people in the crowd by that point were not campus students. Some individuals smashed ATMs from the Bank of America on Telegraph Avenue, while others sprayed the words “Kill Trump” on the front of Noah’s Bagels. BPD announced about 8:40 p.m. that there “may have been (a) hit (and) run collision … where a person may have been struck,” involving a white BMW at the intersection of Durant and Telegraph avenues. BPD said, however, that it has not found the victim. 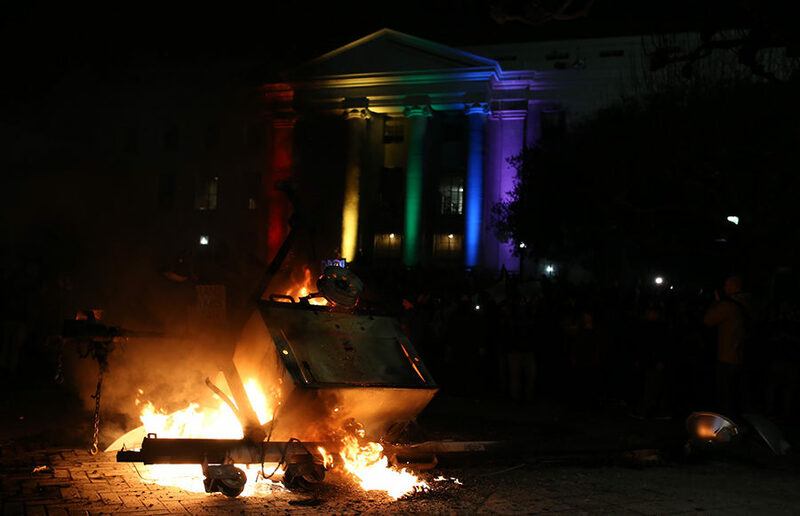 About 9:24 p.m., a group of 200 to 300 people started moving back toward the UC Berkeley campus, with members of the crowd continuing to vandalize businesses. A few minutes later, there were reports of riot police near California Hall. By 10:52 p.m., UCPD issued an “all clear” for the shelter in place. UCPD warned the community to be aware of the debris left over from the protests, and it announced that the campus will still be open Thursday morning for business and regularly scheduled classes. Students expressed concern and disappointment that the protest had escalated to violence. Some began cleaning up after the crowd on Telegraph Avenue as it began to disperse, and campus senior Mako Inouye wiped off vandalism from the Bank of America ATM machines. After the protests, some students organized a Facebook event called “Clean Up Berkeley” to encourage the campus community to help clean up the neighborhood. Chancellor Nicholas Dirks will be sending a message to the campus Thursday to address the fallout of the Yiannopoulos event, according to Mogulof.